Alexander would like to acknowledge the traditional owners of the land he lives and works on, the Ngunnawal and Ngambri people, and pay respect to their elders, past, present and emerging. Alexander Boynes is an Artist, Curator, and Program Manager at the Canberra Contemporary Art Space. 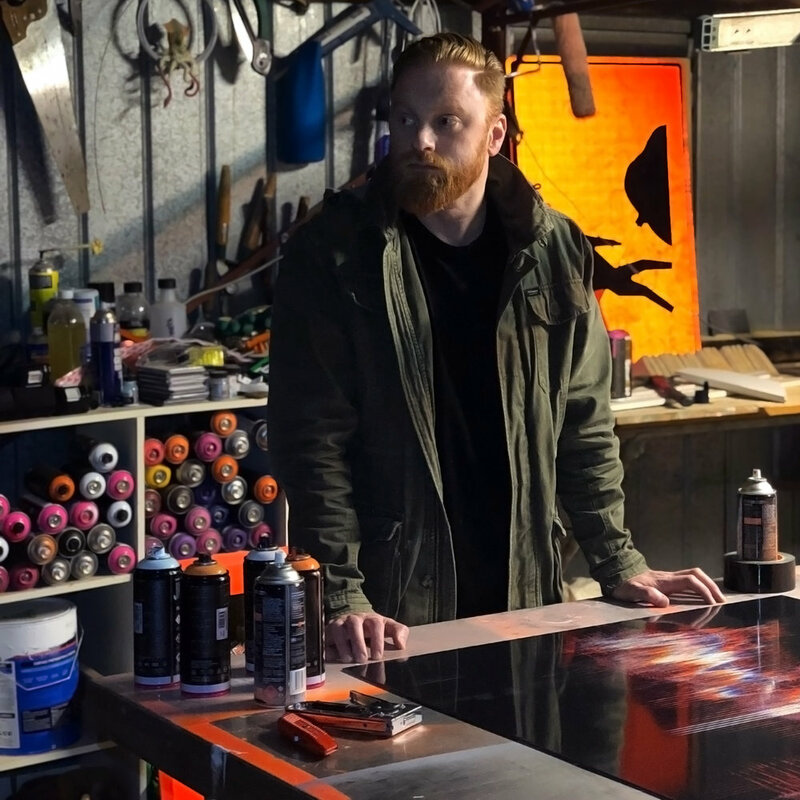 He received his Bachelor of Visual Arts (Honours) at the ANU in Gold and Silversmithing; however, his practice has evolved to include painting, photography, print media, light-based work and video installation. He is represented in the collections of the Center for Art + Environment, Nevada Museum of Art (USA), Artbank Australia (VIC), the ACT Legislative Assembly (ACT), the University of Canberra (ACT), the Macquarie Group Collection (NSW) as well as numerous private collections throughout Australia and in London. His recent curatorial projects include Straight Outta Canberra (MAY▲SPACE, Sydney, 2018), and Blaze Twelve 2018 (CCAS Gorman Arts Centre, 2018). Previous exhibitions at CCAS include 2°— Art and Climate Change, 2016; Footy Fever, 2015, Blaze Nine, 2015, Action Stations—Peter Maloney and Louise Paramor, 2014, and The Triangle – Political Art in Canberra, 2013 in addition to co-curating numerous projects. In 2013 Boynes established PRAXIS,a multidisciplinary art collective with choreographer/dancer Laura Boynes, and cellist/composer Tristen Parr to explore the link between visual art, performance, and sound. Their most recent work Dark Matterwas presented at the State Theatre of Western Australia in 2016. He has also produced a series of major collaborative painting, moving image and sound works with Tristen Parr and visual artist Mandy Martin. These urgent politically charged worksreflect on the loss of the Australian landscape in the drive to extract what is beneath it by the fossil fuel industry; land that before anything else is held in the custody of Traditional Indigenous owners. This merging of landscape and industry speaks of our failure to invest in a renewable future, as coal, oil and gas extraction dominate the power industry. In recent years Boynes was involved in the Arnhembrandproject, which aimed to raise awareness of the work undertaken in the Djelk Indigenous Protected Area, Northern Territory, to preserve the unique cultural and ecological environment by promoting healthy country and communities through art, science and stories. In 2018 Boynes exhibited at Sydney Contemporaryinternational art fair, and held solo exhibitions at Beaver Galleries, Canberra and MAY▲SPACE Sydney. Alexander Boynes is represented by Beaver Galleries in Canberra, and is an exhibiting artist with MAY▲SPACE, Sydney.